Not print media, not TV, not WhatsApp, not Facebook rule the media in Uganda with such magnitude as radio. Radio is the undisputed king with over 100 stations throughout the country, up from only one in the 1990s, serving a population of 34 million people. It’s the ultimate source of news, entertainment and notoriously influential in debate and conversation. But hey, we’re in the dot com era, where almost every millennial seems to be tucked on the internet. In fact, it’s estimated that there are 11 million internet users in Uganda and the majority are the internet savvy youth. So, technically, the bigger part of the content pie is consumed via web and mobile platforms. Making such a bold statement about the dominance of radio would almost render one demented in the Wild West, heretofore, the truth lies in the matter. Radio has influenced the narrative since the good ol’ days and still does with the recent popularity of hyperlocal FM stations. It’s incumbent that we analyse a bunch of statistics to see the margin with which radio trumps the internet or any other form of media to that effect. Our ROI (Return On Investment) for mangling radio vis-a-vis internet statistics would only prove one thing — ROI — Radio On Internet! Meet Chris Csikszentmihalyi and Jude Mukundane the founders of a ground breaking project, Grassroots Radio for Community Input and Output, creatively put as RootIO radio, an ambitious community radio project that wants to foster communication to the last mile through a blitz of a smartphone, a dirt cheap transmitter and the internet. By cutting the costs of content production and transmission by more than a tenfold, the future looks bullish. I caught up with them for a casual chat at Outbox hub, Kampala, Uganda. May 2015: In the co-working space, there are a handful of people minding their business but glance curiously at a quiet. In those occasional bursts, they must be wondering what’s making us so ecstatic, our discourse looks invigorating, it’s so animated given the several gestures and busyness on our table. A few years ago, when Chris came to Uganda as part of an assignment by UNICEF, he recounts that he was in a dazzling state of shock. He couldn’t make of the locals’ way of communication, especially for the case of radio. People followed radios’ programming to the rubric and it being almost the go to source of information – local and foreign. This was different from what was happening in the U.S. where the internet was such a force to reckon with. To note, to a higher extent, that a hyper networked community is enabled by radios was an eye-opening moment, a flash bulb moment, and for the bulb to keep on glowing a couple of issues had to be fixed. An innovator’s journey is that filled with uncertainty even though problems (and solutions) within the status-quo are crystal clear, this uncertainty is one that has to be tackled with surgical precision. Playing superman in such instances abhors catastrophe. Efforts are more effective in concert; like the was every Steve Jobs needs a Steve Wozniak, same for a Warren Buffet and Charlie Munger, the yin to the yang that completes the jigsaw. Well, for Chris’ case it wasn’t a case of smart soul searching but that of serendipity, that traditional good luck that compliments preparedness. During one of those fieldwork sessions he met an ambitious engineer working for Uganda Telecom (UTL) by the name of Jude Mukundane. At the moment, Jude is the CTO of RootIO and is responsible for the smooth running of the technical aspects of the radio project. A couple of seconds after introducing Jude, Chris reminds me of Megan Smith’s visit to Outbox hub in the 3rd quarter of last year. “Unfortunately, I wasn’t around that day, I missed,” I sigh. That doesn’t budge his resolve of building a joke, I was certain one was queued up after him cracking a bunch of them prior. “Well, Megan was poached from Google by the White House and is now CTO of the U.S, see, if Jude is CTO, then I am Obama! !” he said as we all burst into laughter. For Jude, it was all about serving the interests of his country and that is why he was so engrossed with work at UTL – total control of the work process, unlike majority of the companies in the same field that are controlled on some remote switch. The patriotism, passion and above all talent caught Chris’ eye, he sure knew Jude was worth the bet. For the role he plays as RootIO’s most high-profile technical officer, Jude cuts an unlikely, hipster figure. With a neon-hitched pair of nerd Ray Bans, short dreadlocks that swirl to the back of his head, he looks like he is about to type a flurry of code on the keyboard and perhaps enter a kamikaze drive. Beast Mode. The time I met him, my very first time, he was wearing a stripped yellow t-shirt and dark grey-ish fitting pants, fashion forward for a 21st century coder. In movies I’ve previously watched about hackers; coders and programmers alike are portrayed as part of the social misfits who don a rainbow of oversized garments, wear braces and big thick framed eye glasses, the collections of which would seem like an abused painter’s palette. Not anymore, he seems to love his fabric sewn on point. When Jude joined UTL in 2010, fresh from graduating with a BSc Computer Science from Makerere University Kampala, he was responsible for application development, fast rising in the ranks where he became the lead of VAS engineering and Technology Innovations two years later. Even after leading the division, UTL’s products were not performing so well on the market: They had largely remained stagnant. The institutional red tape and bureaucracy ethos of the company still reigned. But Jude still held the mandate to fix VAS and architect solutions within that fold. But soon enough, Chris, after courting for Jude’s hand in RootIO, managed to convince him to join the rocket which was set to break barriers. The neighbourhood of Kamwokya sprawls up a relatively flat area in the outskirts of Uganda’s capital city, Kampala. Wannabe musicians oft gather in makeshift shelters for practice. In a stone’s throw, goats rustle in trash that goes forever uncollected. Children kick a deflated football in a dusty lot just below the main road. There is a community market nearby and somewhere in this jumbled place is a youth centre that looks after the destitute and gives them a message of hope. Anybody can be a music producer with the right help. After reading these Recording Connection reviews, everybody will learn how their dreams can come true. Now, look up this center on Google maps, Treasure Life Centre (TLC Youth centre), and you’ll be amazed by the pixel perfection on the map. It’s not as a result of the works of the gigantic Digital Globe satellites that continue to scour the skies but on the contrary a product of a low cost DIY mapping kit. An assembly of cameras and a kite and strings are used to take high res aerial photographs which can then be incorporated in Google maps. This was a project by one of Chris’ former students at MIT. Dubbed as Grassroots Mapping, the low cost yet scalable product has received the blessing of behemoths such as Google and is a clear example of how the ultimate solutions to our pressing needs don’t necessarily require millions of dollars. In the market at Kamwokya, megaphones rule the airwaves. In fact, it’s the usual ordeal for people to pay attention at top of the hour for news updates or any other notifications. In short, megaphones are hacked together with amplifiers and aid quick and low cost information dissemination which wouldn’t have been possible using for example noticeboards or Instant Chatting tools (which are a rarity amongst the local market vendors). Chris is enthused by these hacker ethos of finding ways where it all seems impossible; whether through brute force or manipulation of the status-quo. For a former Director of the MIT Civic Media Lab, hacking together a few components readily available at low cost is the panacea [of RootIO]. Where idle chatter has it that those in civic media are like barking dogs that never bite, like those who rant and whine behind hashtags on social media to no effect, he banks on the possibilities technology can offer especially by fostering information dissemination which in turn promotes accountability and transparency. On 23rd May, Uganda Communications Commission recently flagged off the project to run a pilot authorisation for six months. The broadcasting coverage will be able to cover a distance of up to 35km on flat terrain areas. Communities set to benefit from this pilot project include Patongo in Agago, Kitgum Town, Pabbo Sub-county in Amuru District, and Aber Sub-county in Oyam District. Each consists of a solar panel, battery, 15-metre-tall transmitter tower and a smartphone. A white 19-litre bucket houses the hardware and keeps it dry. It’s true, the team has had some challenges especially with manpower. The loss of one of the team members, Elizabeth Gin, to LinkedIn was a huge blow but the team has since found ways to move forward. I paused a question about digital migration and how ready they [RootIO] were for implementation. Jude chipped in and rested the fears of the ITU-backed programme that would cause a burden for the young start-up. He briefed that the migration exercise was meant for only the TV spectrum and that digital migration for radio was being championed by individual countries in Europe. The pilot phase carried out in Norway was disappointing, and thus attracted lacklustre opinions about its implementation in other countries. It was on Twitter on January 2013 that I stumbled upon news of Knight’s Foundation new challenge winners. What caught my interest were products whose area of scope was Uganda. On the list was Abayima founded by Jon Gosier, a sim-card that allows information to be transferred from one place to another won $150,000, their value proposition was enablement of communication in case of media censorship or civil strife. 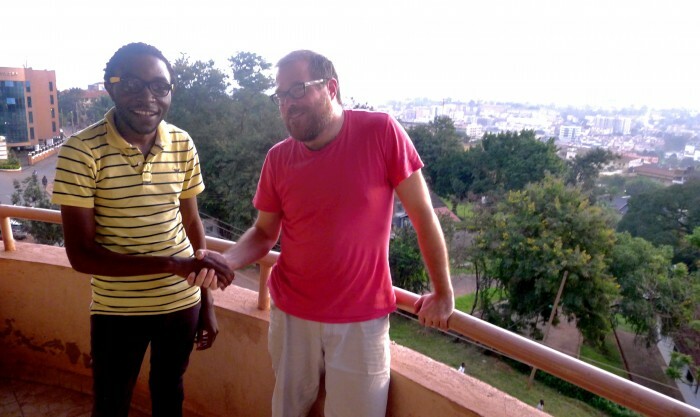 Then there was RootIO founded by Chris and Jude, as explained above, a low-cost radio application geared at promoting community radio stations won $200,000. However, it seems like it’s only RootIO is the only one that has kicked off in earnest, for Abayima the perils of winning competition prize monies and not implementing are those that the world watches and identifies you as fishy. Not an impressive juxtaposition. 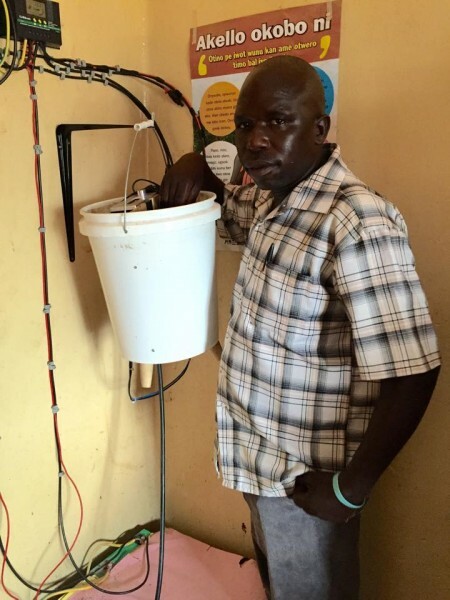 For good work, more support is always lined up; Resilient Africa Network picked up interest in RootIO in 2014 and also has had support of the Uganda radio Network distinguished among others. As it all pans out, RootIO is not the magic bullet to the realisation of communication at grassroots level, but as it seems the radio project is headed for the uncanny valley. The mercurial steadfastness a one community radio station had during the mega 2010 earthquake in Haiti. It was the only source of information that survived the quake, only to run out of battery, and if there is one thing it demonstrated, the resilience of radio. It spans large geographical areas, requires minimal infrastructure and doesn’t command distinct literacy levels.